Around this time, I started to read Katrina Kenison’s memoir, “Magical Journey”, one of two books I’d given myself for Mother’s Day. Within, I found a fellow traveler grieving for her own old friend. “She’s been gone three months and I’m still not used to the world without Marie in it.” A few pages later I realized I had tears in my eyes as I read about Katrina’s loss as if I were reading about my own. 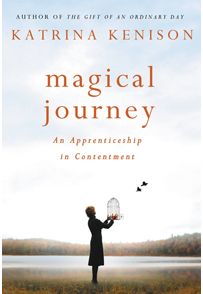 In “Magical Journey,” Kenison is a pilgrim in the land of impermanence. As I read her book, I felt as though I were taking each step with her, sometimes forward, sometimes back, and sometimes into familiar territory. When she described finding herself suddenly untethered to the daily routines of childcare, I remembered the first year after my son went away to school. when coming home from work meant coming home to a lonely silence and a strange, unsettling feeling that I often tried to ignore by throwing myself into work or hitting the gym. Like Katrina, I came to understand that the crack in what she calls the container we’ve built for ourselves represents both an ending and the beginning of whatever is next. What I came to appreciate most about “Magical Journey,” however, is that there were no discussions of “bucket lists” or developing action plans and strategies for the second half of life. In fact, Katrina spends a lot of time being still and grappling with not knowing exactly what is coming. In writing about this stage of her life, Katrina touches on the changes that come to all of us. Loss. Love. Children. Letting Go. Hanging on. Not knowing. Learning to trust and live in a world where nothing is permanent and time seems short. Reading “Magical Journey” helped me to remember that ultimately the place we’ve been headed all our lives, the place we must truly learn to inhabit, is now. One final note. As I sat down to write this, I visited Katrina Kenison’s blog only to find that she has encountered yet another reminder of life’s fragility and the need to let the current moment guide our actions. She had been planning to write many blog posts and ask that readers consider buying a hard copy in the books stores while they remain. The death of a young friend has led to a period of silence and I would like, because I feel so strongly about this book and know many of you will find it a beautiful piece of writing, to ask you to consider buying a copy if you do not win the copy signed by Katrina Kenison that I have waiting for the winner of my drawing on August 8. See below for more details on that. And thank you. With this post, I wrapped up a month-long celebration of journeys and books. Each post focused on a particular journey and the book that either took me or came along for the ride. Because this month also encompassed my birthday, always a milestone in life’s journey, I wanted to celebrate by sharing the books I mentioned here. Beth of I Didn’t Have My Glasses On won a SIGNED copy of “Magical Journey” by Katrina Kenison, by being among those who left her thoughts or “Liked” this post. Congratulations! By the way, the winner of the drawing for “Stranger in a Strange Land” is “Fat Bottom Girl Said What?.” Her blog is lively and sometimes heartbreaking. Check it out at http://fatbottomgirlsaidwhat.wordpress.com. What better way to celebrate birthdays and life than with books. Beautiful post. Betsy this is such a beautiful review! Yes absolutely nothing is permanent and I usually respond to this fact with fear. I am so sorry for the loss of your friend. Thank you for writing so honestly about grief and the changes in our life, that while universal, feel deeply personal. This is a book I will want to like to read. I have been in the company of grief for some time and have written my own book about that: A Reluctant Life..It was written during the course of one year after the death of the man I loved the most..a journal that spoke of the experience before during and after his death..since it is a subject now being discussed as it always will be, for none of us are immune to the life experience of death..I also invite you to the book’s website: http://www.areluctantlife.com and/or participate in my blogsl yvettenachmiasbaeu.wordpress.com. yvettenachmias-baeu.blogspot.com in which there is meditations, wisedoms, tributes to this one divine experience. “When she described finding herself suddenly untethered to the daily routines of childcare, I remembered the first year after my son went away to school. when coming home from work meant coming home to a lonely silence and a strange, unsettling feeling that I often tried to ignore by throwing myself into work or hitting the gym. Like Katrina, I came to understand that the crack in what she calls the container we’ve built for ourselves represents both an ending and the beginning of whatever is next.”. . . .this is exactly where I find myself right now, so this post really gets to me. I always find it so amazing, how the universe brings us what we need, when we need it, and I really needed to read this post today, after many tears have been shed in the last couple of days. I hope to discover what my new beginning is in the midst of my anguish over my son going to live with his father, and I hope this is going to be a positive journey for my son too. Thanks so much for supporting my blog, and for the book!! I’d love to have this book..I’ve been dealing losses this spring and felt an unexpected depth of grief. A beautiful post. It’s funny how our lives have a certain synchronicity. I haven’t lost a friend, thank God, but I have been feeling at a loss while simultaneously feeling so grateful. My 44th birthday last week was such a high, having my family with me and a few old friends, mostly new ones. Then, I was alone. New home, new city; just me, my writing, and an unfruitful job search. It’s hard not to see results. My mother worried; she said she heard me so sad. No, I replied: “I am eternally grateful for such a wonderful husband, loving family, doing what I love.” And that we are all healthy. So just like your post: that’s life, right? A little down with a little up. Thank you for sharing and book recommendation. I will check it out. And please, let me know the date of your birthday as I definitely want to be cognizant of the day and send some special energy your way. What a touching story about your memories with your friend. It certainly leave a hole where they once were. I’m glad this book help you process the pain. I’m sorry for your loss. You feel what you write. Thank you. I found this essay through Katrina’s Facebook page. It is very timely because I lost my mother early this morning. The paragraph about loss really hit home for me. It describes the feeling of loss perfectly. so glad to read this post and remember why I enjoyed reading Magical Journey so much. Makes me want to read it again. Thank you for sharing. I’ve found a new blog to follow. I truly enjoy reading Katrina Kenison’s posts. She is very inspiring. I recently finished Katrina’s book “The Gift of an Ordinary Day” which was absolutely wonderful and I have “Magical Journey” downloaded on my Kindle. I have not started it yet, but will soon as I too can relate. Our only daughter will be leaving for college in a week! We are so very excited for her but can’t imagine our “ordinary” everyday moments without her in them. We also suffered a great loss when my mom passed away just a year and a half ago. During which time a dear friend was diagnosed with breast cancer. I’m happy to say she is doing great & is cancer free! Over time we begin to find our new sense of normal, but to find ourselves “untethered” to daily needs of our children is definitely new territory. We are fortunate to live close enough to the college to be able to attend her music performances! However my husband & I are also looking forward to our new chapter as well. I found Katrina’s book very inspiring and relatable, I have no doubt that “Magical Journey” will be just as wonderful. Something happens as we get older, we learn what’s really important, life is too short to waste time on the negative things and It is all about the journey not the destination, enjoy every moment! I have been a big fan of Katrina Kenison’s for years! Her first book, Mitten Strings for God, made a huge impact on the way I approached parenting as a young mother. I am about to experience the empty nest myself, and have been planning on reading Magical Journey to help me through this transition as well. I am sorry for your loss and glad that Katrina’s words have given you some comfort. I love the idea that you gave yourself books for Mother’s Day. Important to nurture ourselves. Katrina’s writing always resonates with me as well. Having spent my year 50 in the midst of personal, family and professional turmoil I am struggling with some of the same ideas she speaks of in this latest book. The older we get, it seems loss and transition in various forms become a common theme for most of us. For me it is a struggle to manage balance and peace with new realities and responsibilities at this stage of life and to not let the unknowns ahead fuel worry, fear and poor decision making. Grief, whether it be related to physical or figurative loss, is a funny thing. It can take a choke hold over everything else. It is like a fog that penetrates every nook and cranny of our lives. It is a gift to see beyond it. I would really love to win a copy of this book. A beautiful review that had me in tears. I so want to read Katrina’s book. I, too, have been trying to live in the moment. Dogs do it naturally, but it’s not so easy for us humans. I sometimes wish I was a dog. I agree. My dog teaches me daily, or tries to. Thank you, Lindsey. I’ve often read your blog and found it full of insight. Thank you so much for stopping by.